Polyhedral sundials of this kind, with finely decorated faces, are typical of the production of Stefano Buonsignori, an Olivetan friar, who was cosmographer to Francesco I de' Medici. 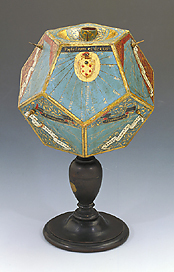 This sundial is in the form of a regular dodecahedron, richly coloured and also decorated with the coat of arms of the Medici dynasty. The upper cavity has a housing for a compass, which is now missing. Each face of the instrument carries a different type of sundial, complete with gnomon. The compass allowed the instrument to be correctly oriented towards the North. In this way the shadows of the gnomons projected onto the hour lines indicated the time. The dial bears the monogram 'D.S.F.F. ', an abbreviation of 'Don Stefano Fiorentino Fecit'.